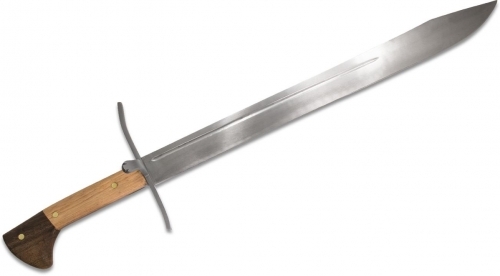 The designs of the Messer Swords were inspired by Condor's German origin. These beautiful renaissance replicas have thick blades with astonishing sharp edges and are full tang. The wood handles are made of burnt American hickory and Walnut. The Condor Messer Sword is intended for a one hand use while its larger brother, the Grosse Messer Sword, can be used with one or two hands for a perfect balance. Each includes a hardwood covered leather scabbard.